The Warnow Tunnel in Rostock, Germany is now experiencing smooth traffic flow thanks to an RFID-based toll collection system commission by Schreiner PrinTrust. 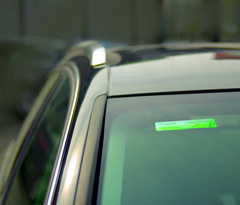 The automatic vehicle identification system leverages the Schreiner PrinTrust ((rfid)-Windshield Label, equipped with a specially adapted antenna for application to windshields and other glass substrates. The compact RFID label establishes a connection with the corresponding customer account and the toll fee is debited according to the type of vehicle at the gate. The windshield sticker features a two-second response time which makes it possible for the vehicle to pass the gate at low speed without stopping. The rfid-Windshield Label enables automatic and contactless identification of vehicles in moving traffic. While the vehicle is moving at low speed, fast and reliable data transmission is possible across a distance of several meters. Additionally, integrated counterfeit protection features deliver high levels of tamper protection.